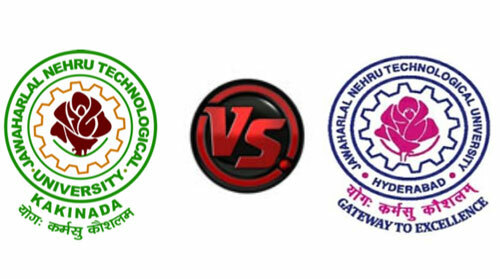 Jntuk VS Jntuh Engineering Course - Differences, fees, duration, placements, syllabus, Companies and etc. Many people have this question in their mind. Everyone on the earth desires to be in a good career path and looking forward to doing best courses in top universities and colleges. Jawaharlal Technological University this is a university name which is having many branches in Hyderabad, Kakinada, Anantapur and etc. Let us now discuss and see some differences between Jntuk VS Jntuh. 10 Companies which visits JNTUH for placements are as follows. 11 Companies which visits JNTUk for placements are as follows. JNTUH B. Tech, MBA, B.Tech + MBA, M.Tech, B.Tech + M.Tech, B.Pharm, M.Pharm, MCA, PH.D, M.Phil., M.Sc. Companies which visits JNTUH for placements are as follows. Indus Towers and many more. Companies which visits JNTUk for placements are as follows. Idea Bytes Limited and many more. In JNTUK and JNTUH syllabus regulations changes for every 3 years. For more details about JNTUK CLICK HERE. For more details about JNTUH CLICK HERE. The above-presented article is providing you all the information related to Jntuk VS Jntuh. Interested students who want to join in these universities of your interested course can refer here and place your career in top place.